The global oncology biosimilars market is prophesied in a report by Transparency Market Research (TMR) finds highly competitive and highly fragmentation owing to presence of strong players in the market. In order to acquire substantial share and to be part of such intense competition, these key players have adopted strategies such as frequent mergers and acquisitions, product innovations, and geographical expansion. Leading companies in the global oncology biosimilars market that are profiled in this report are Biocon, Celltrion Inc., Dr. Reddy’s Laboratories Ltd., Intas Pharmaceuticals Ltd., STADA Arzneimittel AG, Pfizer Inc., Apotex Inc., Teva Pharmaceutical Industries Ltd., Sandoz International GmbH, and BIOCAD. The global oncology biosimilars market to expect to expand with a CAGR of 27.5% from 2017 to 2025, for the market to attain the value of US$17,478.2 mn by the end of forecast period considerably up from registered value of US$2,100 mn in 2016. On the basis of disease indication, neutropenia dominates the market owing to patent expiration of well-known oncology biologics coupled with efforts from several governments for developing affordable medicines available to patients. 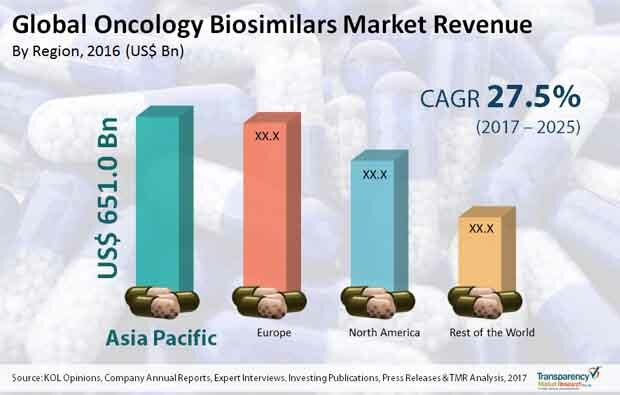 On the basis of region, Asia Pacific accounts for the significant share of the oncology biosimilars market in 2016 owing to availability of cost effective cancer medications with minimal side effects via retail stores in this region. Increasing number of prevalence’s of for cancer such as breast cancer, lung cancer, cervical cancer, and stomach cancer is boosting demand for the proper treatment of every type of the caner, in turn is expected to drive the global oncology biosimilars treatment market over the forecast period. The oncology biosimilars market is projected to be beneficial from rising demand for inexpensive cancer therapies. Cancer is the costliest health disease in terms of diagnosis and treatment. Pharmaceutical companies present worldwide are focused on development of biosimilars and generic medicines to fight cancer at all stages and for the one full treatment of the disease. Increasing number of alliances for development of biosimilar is expected to propel the growth of oncology biosimilars market over the forecast period. Oncology biosimilars are the versions of biologics which are manufactured by numerous companies and has been officially approved for cancer treatment. They are cost-effective and efficient as the original biologic. Adoption of oncology biosimilars for the treatment of cancer is boosting growth of the global oncology biosimilars market. Additionally, increasing number of product approvals for treatment of various types of cancer is anticipated to fuel the growth of the market. However, complex manufacturing process and its approval is the major factor restraining growth of the global oncology biosimilars market. Nevertheless, patent expiration is creating lucrative opportunities for the key players in the global oncology biosimilars market.